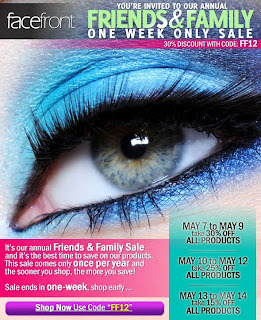 FaceFront Cosmetics was one of the first 'indie' brands that I was introduced to in the internet makeup world. They seemed to vanish over night, then resurfaced again with some great new product launches after being acquired by a new company. 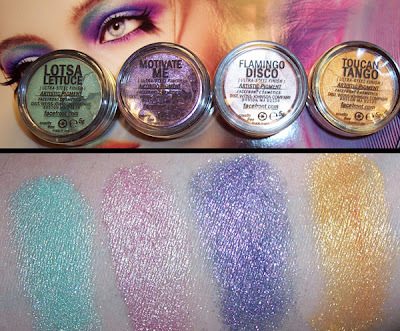 While sticking to what they do best with cutting edge loose artistic pigments they've also brought in to the mix blushes, setting powders, pressed shadows, liquid lipsticks, bronzers, and cream products. FaceFront has stayed true to its image: being viewed both as an environmentally responsible brand and more recently, a great find for those seeking vegan-friendly products. 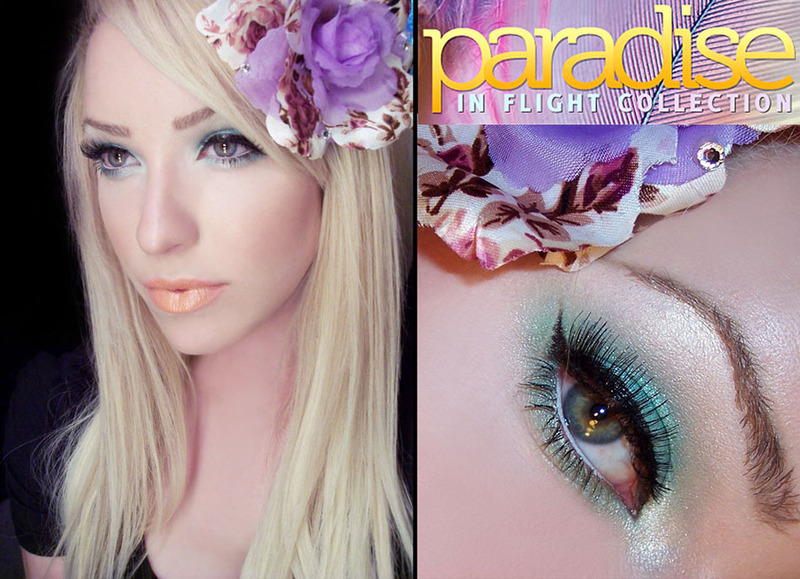 Their latest LE Spring 2012 Launch, The Paradise in Flight Collection, is heavily focused on the "illumination" and "glow" of the skin. It brings us shades from the elements that can transcend across a broad range of ethnicity's and skin colors. Paradise in Flight FOTD: Lotsa Lettuce Artistic Pigment, Autofocus Highlight Powder, Proper Peach Blush, Heatstroke & In Motion Liquid Lipstick. The collection has a common undertone throughout and features mint and orange, two of the season's hottest colors. I feel this color palette will suit you bronze beauty's with darker or warmer skintones more so than they do me, but the colors are so dazzling and Springlike that you can't help but want to take flight with them. Individual Product Review and Swatches after the cut! Autofocus: Sheer, pearled white gold. The highlight powders are made up of delicate Australian micro pearls that are finely milled in texture and create a sheer subtle sheen. Double exposure is a champagne shimmer and Autofocus is a gold white pearl. Both look radiant placed on the high points of the cheek bones, cupid's bow, and as brow and inner corner eye highlights. I really enjoyed these highlight powder's, they give a beautiful sheen with out being garish or glittery. 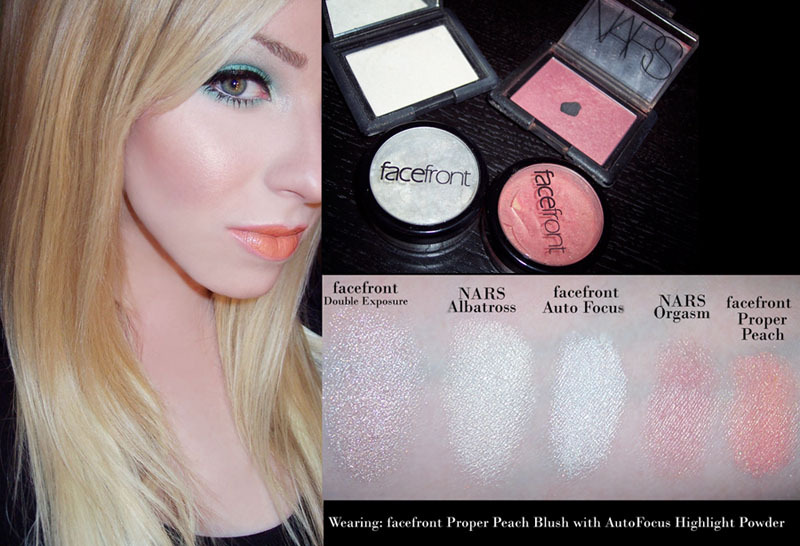 I've tried the mineral blushes from FF in the past and found them too shimmery for my taste. Funfair is a very sparkly cotton candy lavender with little color pay off. Proper Peach is a beautiful coral with much better color pay off and more of a sheen than sparkle, definitely the better of the two. Funfair: Light-toned blue/violet made slightly complex with a depth of orange and warm gold metallic and purple sparkle. Proper Peach: Warm, inviting coral/peach with pink undertone and golden metallic sheen. Both the Highlight Powder and Blush reminded me of NARS. I did a side by side swatch comparison, and while they're not total dupes, they're in the same realm and almost half the price. Defrosting: Light-toned icy pink with brilliant silver sparkle, complemented with subtle golden undertone . Dulce de Leche: Caramel-Bronze with golden metallic sheen worked throughout. The cream illuminator's are a dewy and slick cream gel formula that are meant to be worn like a cream blush. They impart slight color with a subtle shimmer. What I dislike about them is that the texture is very sticky and that doesn't seem to go away once applied. The colors were too dark for me so I'll have to try these out on darker skintones to see how they perform. 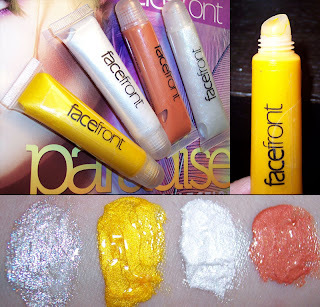 My favorite product's from Face Front have always been the Artistic Mineral Pigments. In general I don't like loose powder products, so it has to be really worth it for me to want to use them. The pigments have a very light powdery texture that give a sheer wash of color when dry. To get to the full intensity I like to apply them wet and pack the shadow on. Lotsa Lettuce was my favorite of the set, followed by Motivate Me. My least favorite was Flamingo Disco, it's a cotton candy shimmer bomb. Lotsa Lettuce: Gilded minty green with yellow undertones throughout and subtle sparks of gold and silver shimmer. Flamingo Disco: Fluffy, “cotton-candy” pink with multi-reflective green and silver metallic elements. Motivate Me: Medium toned violet made complicated with pink and silver sheen upon application. Toucan Tango: Vivacious golden-citrus orange intermixed with chromatic hues of yellow and gold. Available in a squeeze tube these have the saturation of a lipstick with the moisturizing feel of a gloss. I expected these to be light and shimmery like a gloss, but instead they are super saturated with full coverage. You can get a full on marigold lip with MotoTaxi! These shades work particularly well for multi-tonal lips and for adding depth or warmth to other colors. In Motion: Transparent formula with a rainbow of soft, multi-reflective, non-gritty micro-glitters which provide the perfect complement to any lipstick base. Designed as a “lipstick topping” to add dimension to any traditional lipstick or Liquid Lipstick. MotoTaxi: Chromatic taxi cab yellow. My only dislike with the liquid lipstick's is that most of the colors aren't easy to wear. In Motion makes a nice frosty topping to give the illusion of a fuller lip and warmer tones may be able to pull of Heat Stroke. Otherwise they're not very practical shades for everyday wear. I like the formulation of these, so I hope they introduce more wearable colors. This powder is not LE or a part of the collection, but it's the product I've been looking forward to trying the most. Much like your Make Up Forever HD and typical Silica Powders it sets makeup with out adding any color or powder to the finish. It's one of the best silica powders I've tried when it comes to controlling oil & shine.